The slinky stoat is a bundle of energy, always alert and highly inquisitive. If you catch a glimpse of a low-slung chestnut blur speeding across the path in front of you, linger for a moment and a ferrety face might pop out to return your gaze, curious to observe its observer. But is it a stoat or a weasel? Stoats are larger but the only reliable way to tell them apart is a good look at the tip of the tail: if it’s black, it’s a stoat; if it’s not, it’s a weasel. Beyond being a useful identification feature, the black tail serves a vital purpose. 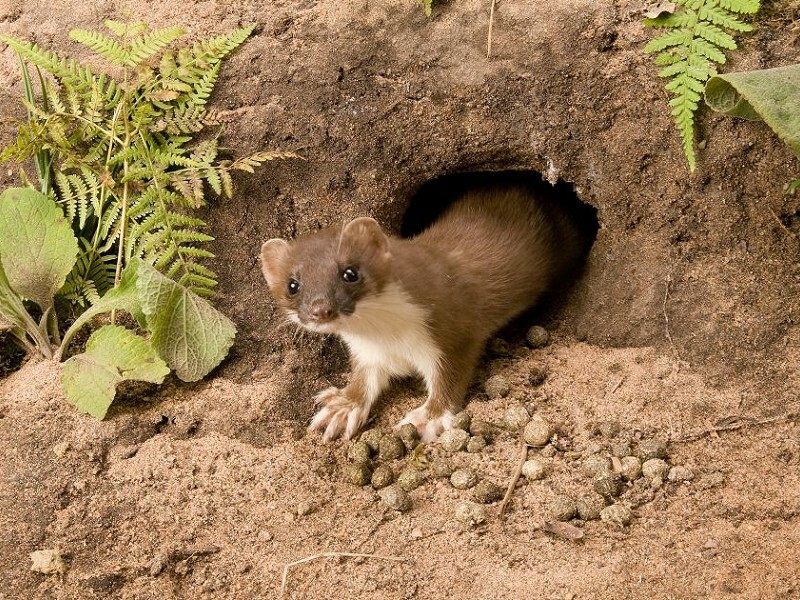 Stoats spend more time above ground than weasels and are exposed to a greater risk of aerial attack. If a bird of prey should swoop in for the kill, a well-timed whisk of the tail provides an effective distraction, stalling the would-be predator just long enough for the stoat to escape unscathed – or possibly with a slightly shorter tail. Stoats are feisty predators themselves and best known for their prowess in hunting rabbits. A stoat tackles a rabbit in the same way that a lion leaps onto the back of a galloping antelope. The action is shrunk down in scale but no less impressive, since an adult rabbit is at least twice the size of a stoat and will bolt for cover at top speed at the first hint of danger, twisting and turning as it sprints to evade capture. But the stoat is swift and tenacious and will stay hot on its heels for as long as it takes, gaining ground relentlessly until it can pounce onto the rabbit’s back, clinging on like a jockey before delivering a powerful bite to the back of the neck with fatal precision. Such a high-octane chase is a huge drain of energy, so a stoat will sometimes employ an unusual tactic. By bouncing, spinning and chasing its own tail it creates such an unexpected, attention-grabbing display that its quarry is captivated, unable to tear its eyes away from the hypnotic antics of the dancing stoat as it cunningly creeps its way closer and closer…until it’s too late.